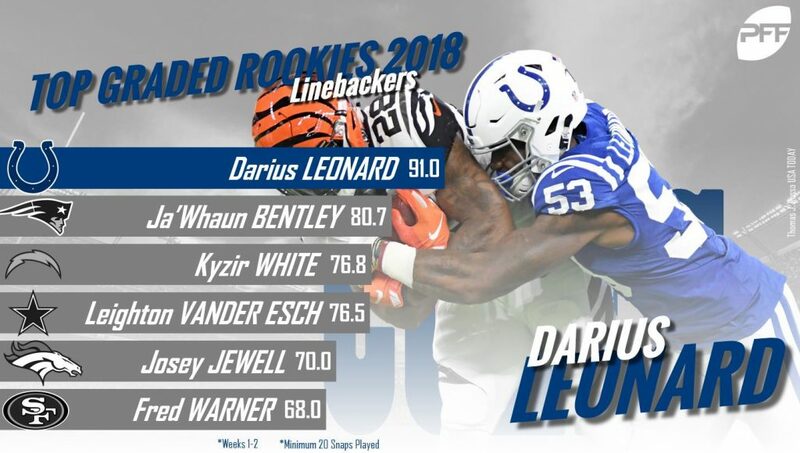 Wednesday means it’s time for the second update of our season-long race for PFF’s Rookie of the Year award. Cleveland Browns’ Denzel Ward and Genard Avery led the charge in our initial top-10 last week. However, with sample sizes still being very small, expect lots of movement early in the season. Without further ado, here’s where the top-10 stands as we enter Week 3. After an outstanding performance in Week 2 – which landed Leonard on our Team of the Week – the rookie linebacker out of South Carolina State vaults his way all the way to the top of our list. The second-round pick ranks second among all linebackers in terms of overall grade for the season, and he’s one of just three linebackers (joining Darron Lee and Deion Jones) who currently owns an elite coverage grade (over 90.0). Leonard recorded six stops against Washington in Week 2 to go with a pass breakup and a forced fumble. James currently ranks eighth among all safeties in terms of overall grade, and he’s posted grades of at least 70.0 in both NFL games he’s played in thus far. James has been a swiss-army knife for the Chargers’ defense, playing 53 snaps at free safety, 37 at box safety, 13 at slot corner and 11 on the defensive line. He’s totaled six pressures so far as a pass-rusher – three more than any other safety. He is also one of just 22 safeties to have recorded at least four stops and one of just 12 safeties to record multiple pass breakups. Avery followed up an elite performance in Week 1 with a bit of a disappointing showing in Week 2. 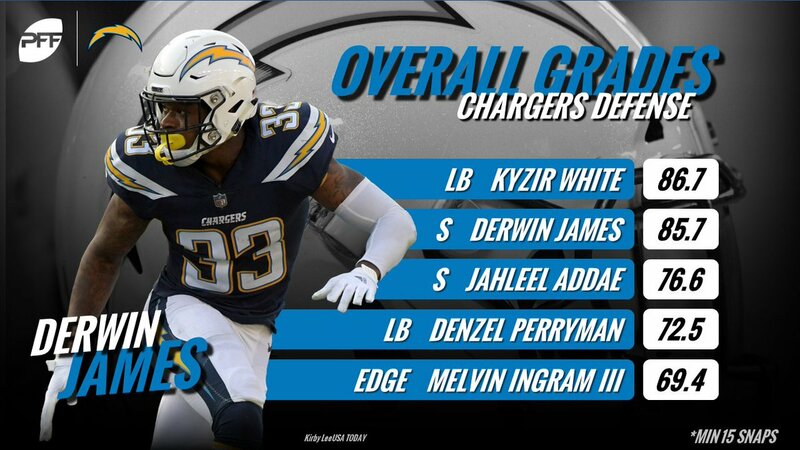 Despite his Week 2 woes, though, the rookie edge defender still ranks eighth among his positional peers in terms of overall grade and owns grades of at least 73.0 in the following categories: run defense, tackling and pass-rushing. The fifth-round pick tallied another run stop in Week 2, and his 21.4 run-stop percentage leads all edge defenders who’ve played at least 10 run-defense snaps through the first two weeks of the season. Hernandez ranks eighth among all guards in terms of overall grade this season, and his 76.3 run-block grade after two weeks ranks third. Our highest-graded guard in college football back in 2016, Hernandez thrived as a run blocker back at UTEP – that skill set was fully on display in Week 2 against the Dallas Cowboys, earning him the second-best run-block grade by a guard at 83.2. Chubb is just one of two edge defenders through two weeks of the season (Trey Flowers being the other) to have a grade of at least 75.0 as both a pass-rusher and in run defense. 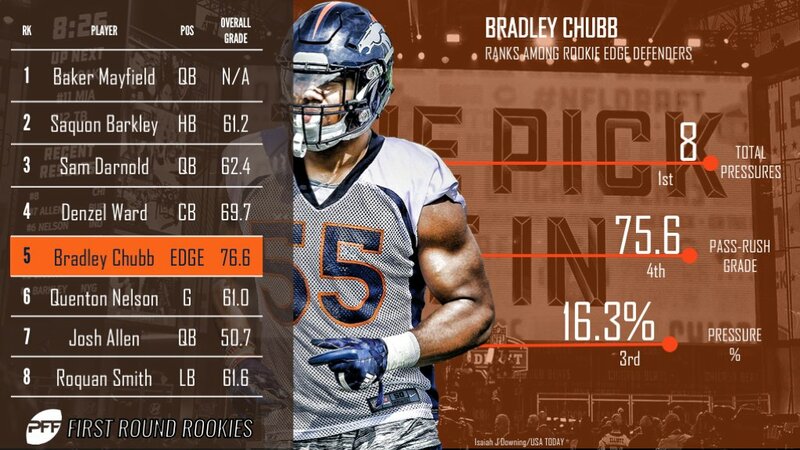 Out of 95 edge defenders who have rushed the quarterback at least 25 times this season, Chubb ranks eighth with a 16.3 pressure percentage; his 11.4 run-stop percentage ranks seventh among the 57 edge defenders who’ve seen at least 25 snaps in run defense. Bentley ranks 10th among linebackers in terms of overall grade, and he’s one of just three linebackers (along with Zach Brown and Bobby Wagner) who rank within the top-10 in both run-defense and coverage grades. The fifth-round pick currently ranks 13th among all linebackers who’ve seen at least 25 snaps in run defense with an average depth of tackle of just 1.67 yards beyond the line of scrimmage. He’s also only been targeted twice in coverage, surrendering just one catch for five yards. The latest defensive interior stud to come from the defensive line factory that is the University of Alabama, Hand has graded well in both games so far this season, earning a grade of at least 78.0 in both Weeks 1 and 2. Through two weeks, Hand ranks 13th among interior defenders in terms of overall grade, and his seven run stops are tied for the most at his position. Bates is second among all defensive players so far this season with 166 snaps, and after Week 2, he ranks 14th among safeties in terms of overall grade. Bates has allowed three catches into his coverage for a total of just two yards this season, and he made a great read on an errant throw by Joe Flacco this past week to record his first NFL interception. 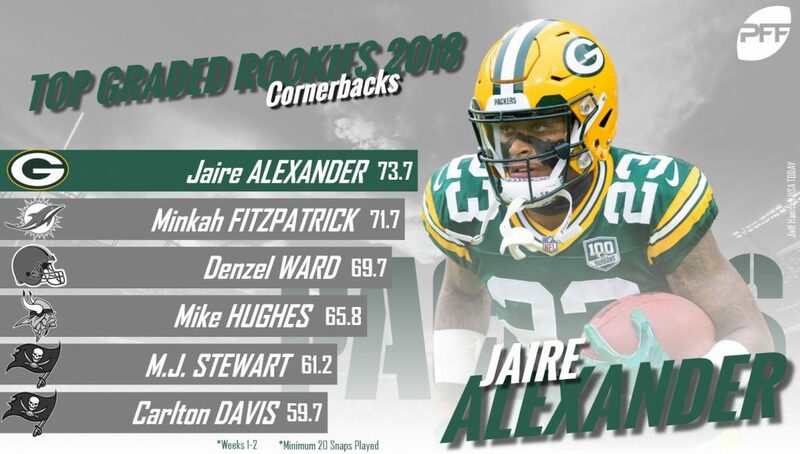 Alexander currently owns the highest overall grade among rookie cornerbacks after the first two weeks of the season, and he ranks 25th among all NFL corners. The rookie out of Louisville has recorded three stops, tallied two pressures (including a sack) and came down with an interception that would have sealed the game for the Packers this past week had it not been overturned by a (controversial) roughing the passer penalty. The third-overall pick currently ranks 20th among quarterbacks in terms of overall grade, and his 61.6 passing grade slots in at 18th. Darnold hasn’t been afraid to push the ball downfield. His average depth of target of 10.4 yards ranks eighth among QBs, and he ranks seventh with 54.7 percent of his throws traveling past the sticks. However, he’s thrown just one big-time throw through two games while recording three turnover-worthy plays. The former Trojan is going to need to turn around that BTT:TWP ratio a bit if he’s going to maintain a spot on this list throughout the season.